So my Taste Trunk arrived a few days ago, and of course I picked the Sweet Trunk again! With my variety of health-conscious boxes, I knew I shouldn’t pick the Health Trunk, plus I’m not a BBQ-er… perhaps next month if I continue, I’ll switch up to the Gourmet one! As usual, I love their packaging. The first look is the gold stamped logo on the simple white box, and then you open the package up to see black and white printed images that take you back in time. With the color scheme: black, white, burgundy, and newsprint, they have won me over in that category. Like last month, Taste Trunk included some interesting information cards on the products! They wrote a bit about where the product comes from, the companies histories, etc. First up is the Iveta All Natural Cupcake Mix in Chocolate Coconut. I love to bake, and so I was pretty excited to get this in my package rather than a pre-baked, pre-packaged cake or something along those lines. It came with instructions as to what to add to the cupcake batter, how to make the frosting, etc. While I may sub some of the ingredients for healthier options, I know I will have fun making these. Next up, I got these crazy gummy/jelly candies. Made by Cheri’s Desert Harvest. In flavors like “Prickly Pear Cactus Candy” and “Margarita Morsels” I was intrigued and curious as to how they would taste. The consistancy is inbetween a gummy and jelly candy, and it’s pretty sweet I have to say. While they may be too sugary sweet to purchase (personally), I would recommend them to anyone who likes sour patch kids, gumdrops, etc. In terms of baked goods, I recieved The Cookie Department Peanut Butter Choc Chip Protein Cookie! It’s like they read my mind and knew I wanted a protein-based one! I have been making protein pancakes so much lately, and so this is great because it fills your craving for sweets while also giving you the protein you need. Finally, we have a familiar food: Nunes Farms almond caramels and chocolate caramels were wrapped up in one of the newsprint brown paper bags. I did enjoy getting the regular caramels last month, and so I had no doubt the chocolate ones would be good as well. However, I’m not a big fan of repeats. I wish I had received the Pacific Beach Toffee Peanut Butter that was included in their Health Trunk… and in my opinion should have been in the sweet one! I love nut butters- peanut, almond, cashew, chocolate peanut- and of course cookie butter! Additionally, while I was happy to receive some of the Nunes Farms chocolate caramels, I did in fact get about a dozen caramels with almonds last month. Luckily I enjoy them, however I think they need to increase their variety and reduce chances of duplications. I think I may switch up my trunk for next month in order to avoid duplicates… perhaps to the Gourmet Box? Anyone prefer one over another? With a cost of $29.00 a month + shipping, this is a pretty good box for the total foodie; You definitely have to love sweets to get this trunk (just like how the BBQ trunk is perfect for a GrillMaster!) 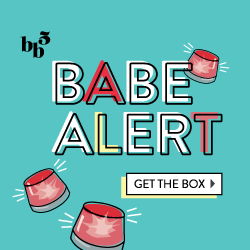 If you decide to sign up, use TASTE25 for 25% off your first box, and please be amazing and write my name “Mackenzie Degen” in the special instructions area.